There are very few signs that slums will transition out of the urban landscape in the foreseeable future. Even after more than one and a half centuries of policy interventions, starting from efforts to address the effects of industrialization in Europe, slums persist in almost every geography on the planet. Slums are not only visible in the Global South, but are reappearing in old and new manifestations in the Global North. Their persistence can be linked to a number of political and economic failures to effectively address poverty and inequality, distorted land markets, and systemic social exclusion. These failures are, in turn, rooted in the very way policymakers, global media, and intellectuals conceptualize and represent how, why, and by whom slums are produced, maintained, and reproduced. Slums continue to be imagined as urban aberrations, something that falls outside of (or delinked from) urban ecologies. 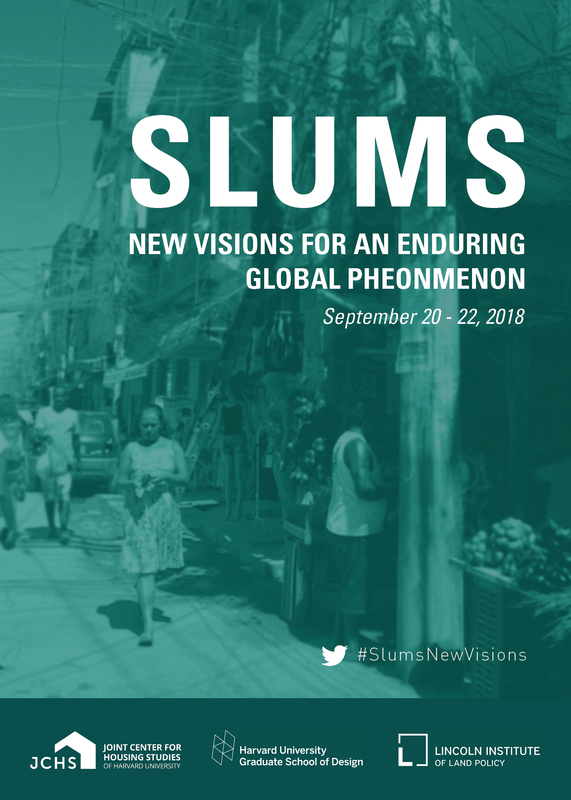 Slums: New Visions for an Enduring Global Phenomenon is a symposium being held at Harvard University from September 20-22, 2018 that will challenge participants to discuss the range of perceptions and systemic changes needed to re-imagine integrative urban and social landscapes, as well as the labor and land markets that most often underpin the formation of slums. Over three days, the symposium seeks to advance new policy, financial, design, and educational tools that can both improve existing slums and generate alternatives to future ones. The symposium starts on the evening of Thursday, September 20, with a keynote at the Harvard Graduate School of Design (48 Quincy Street) and continues on Friday and Saturday, September 21 and 22 at the Harvard Center for Government and International Studies (South Building, 1730 Cambridge Street).